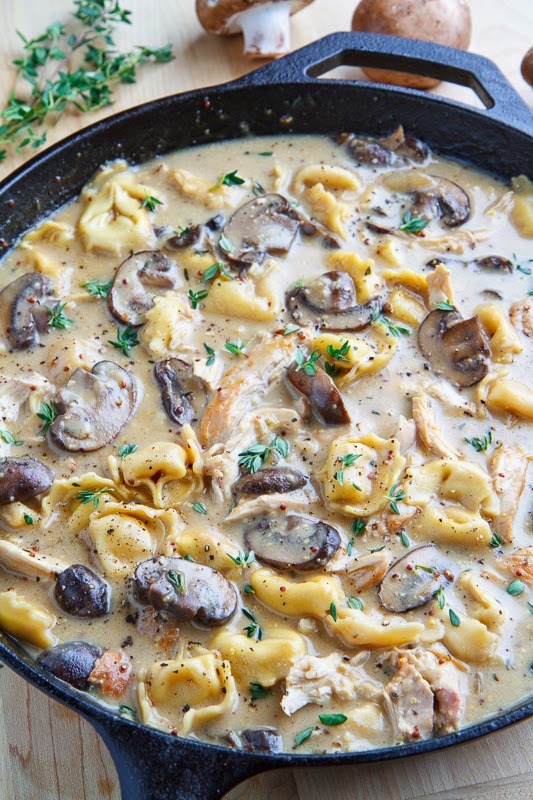 A creamy chicken and mushroom soup with asiago cheese. 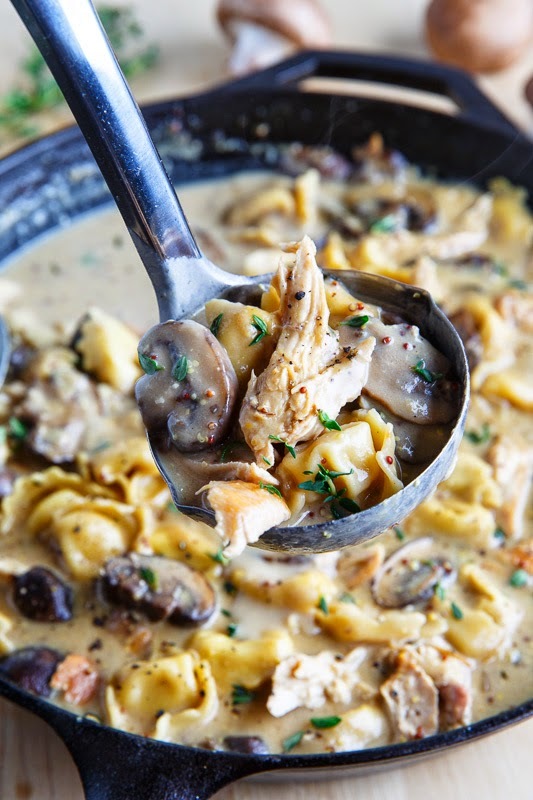 While the weather is still cool enough I have another soup to share and this one is a tasty creamy asiago chicken and mushroom tortellini soup. 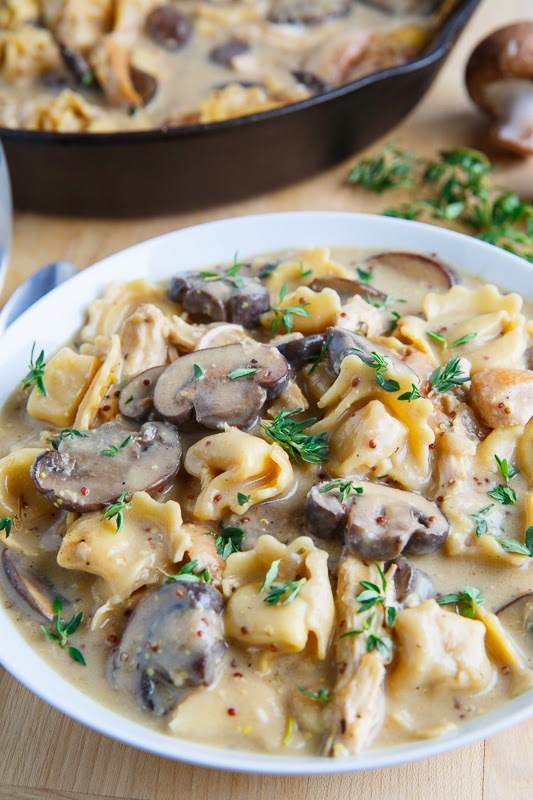 The flavour combination of the chicken, mushrooms and especially the asiago in this soup is pretty simple and yet amazingly good! 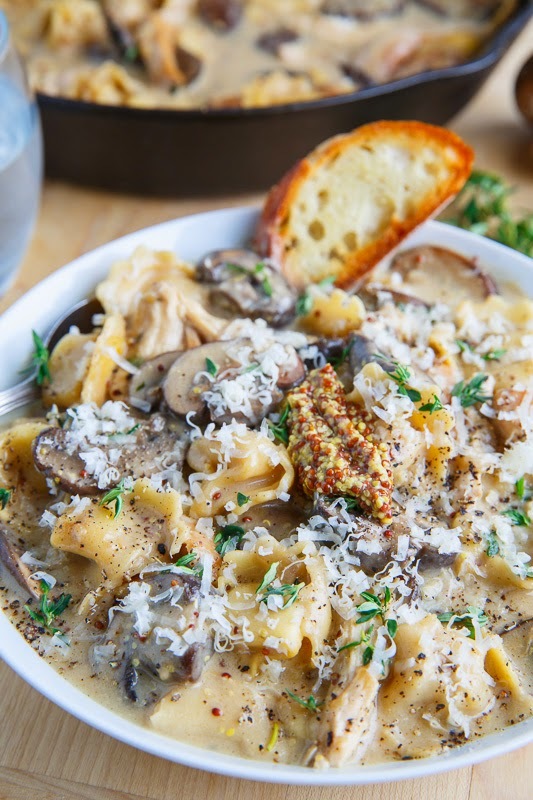 This soup takes a bit longer to make because you have to cook the mushrooms first but other than that everything is pretty straight forward and you can be enjoying a bowl in very little time at all; even on a busy work night! I like to add a touch of tangy spiciness with dijon and grainy mustard and as has become pretty common for me, I like to season this soup with a touch of miso paste to add a hint of umami. No matter how you cut it this soup is a bowl of pure comfort food that is welcome any time! Serve with extra asiago cheese for garnish. Heat the oil in a large sauce pan over medium-hight heat, add the mushrooms and onions and cook until the mushrooms have released their liquid and it has evaporated, about 10-15 minutes. Mix in the garlic, thyme and flour and cook, stirring, for a minute. Add the broth, tortellini and chicken, bring to a boil, reduce the heat and simmer until the tortellini is tender and the chicken is cooked, about 10 minutes. Remove the chicken, dice or shred it and mix it back into the soup. Add the cream, mustard and asiago, let the cheese melt, season with salt and pepper to taste and remove from heat. Option: Cook the chicken in the pan over medium-high heat (before cooking the mushrooms) until golden brown on both sides and set aside to add more chicken flavour. Option: Cook the mushrooms even longer, until they start to caramelize, for more mushroom-y flavour goodness! Option: Roast the mushrooms instead of cooking them in the sauce pan for even more mushroom flavour. Option: Add 1 tablespoon grainy mustard. It has gotten a bit warmer in Chicago but I still could love a bowl of this soup! This looks like the most decadent awesome soup ever! Kevin, this soups rocks. Love it. Delicious. This was is being pinned to my board. that certainly looks like it would fill you up and keep you warm- delicious! I love Asiago, and this recipe turned out delicious! Oh god, this looks amazing!! I love the creamy comfort of this soup!! I would slurp it right up! Kevin, you are seriously the KING of making and photographing gorgeous food. . I can literally see how much flavor you have going on here!!! and love the mustards!! Can I leave out the mushrooms, I really don't like them? Will it change the tast of the soup. I love all the other ingredients in the soup. Ingredients call for 1/4 c. flour, yet the recipe directions make no mention of using that flour. Anonymous: Good catch! I have updated the recipe adding it to step to where the garlic and thyme are added. Thanks! Anonymous: I use store bought fresh tortellini and I usually go for a three cheese one, though spinach would also be good in this. I forget which brand is the one that I usually go for. Okay, one more question about the tortellini – store bought fresh tortellini… is not frozen I'm guessing? I figured since it has cheese it wouldn't be in the (dried) pasta aisle or anything so I'm wondering where in the store fresh tortellini would generally be located. Thanks for answering questions so quickly 🙂 I really appreciate it. Definitely going to make this soon! I already had dinner..and now I want to start over with this! This recipe rocks! 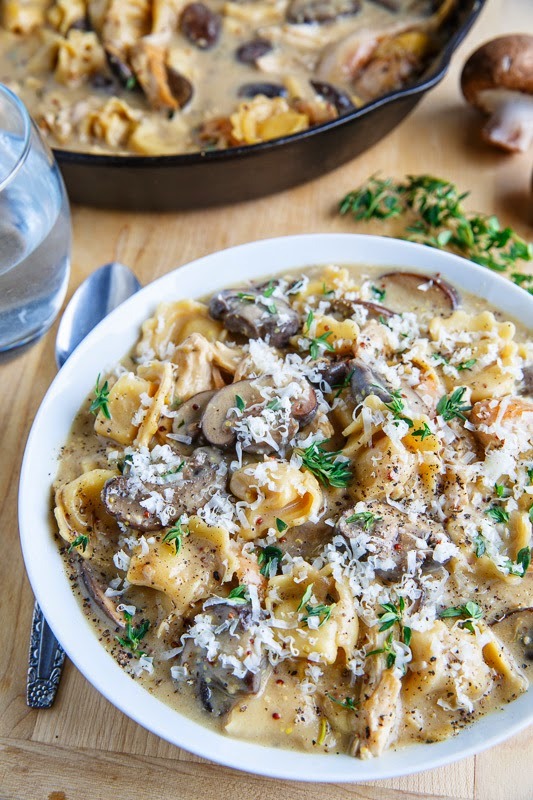 I always put some tortellini in soup, and I love the idea of caramelizing the mushrooms. Google told me that asiago is a cheese! what cheese can be used instead? Judy Goldin: You could use parmesan cheese instead of asiago. This was crazy good! Wonderful been of flavors. I'd really like to cook this but I got confused about the cream. What kind of cream is this? Cream cheese, sour cream, facial cream? It's confusing. I made this for dinner tonight. It was a big hit. Delicious, thanks! Sharon: I'm glad you enjoyed it! I had this tonight and it was delicious!!! However, I doubled the recipe and I have too much leftover. I was curious if you can freeze a cream/cheese based soup like this? Jonathan Holt: I'm glad you enjoyed it and it does freeze well! Made this the other night & loved it! I added spinach to it. This may be my new favorite soup. Made as directed…was absolutely delicious! Everyone loved it.